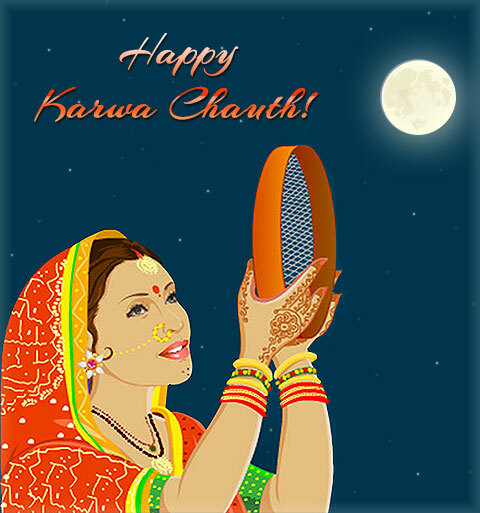 Karwa Chauth or Kadwa Chauth is a festive ritual. It is observed by married women, its aim being the longevity of women's marital life. In India, a marriage is considered to be a bond of a lifetime. This marital bond is considered very sacred. Celebrate this bright and vivid cultural ritual with the entire team of TheHolidaySpot. Extend your love and respect to the traditional values of Indian womanhood and wish them all a very 'Happy Karwa chauth'. Let them cherish the nuptial bond yet again this Karwa Chauth. Know the traditional songs sung by Indian women during this festival. Discover the various traditions and rituals associated to Karwa Chauth. Learn about the different myths and legends tied in with the festival. Send your heartiest wishes to loved ones with our elegant e-greeting cards related to Karwa Chauth. Grace your desktop with and send to loved ones free, elegant wallpapers themed to Karwa Chauth. Read and be enlightened how Karwa Chauth got its roots and evolved with time. Prepare some mouthwatering dishes on the occasion with our cooking directions.